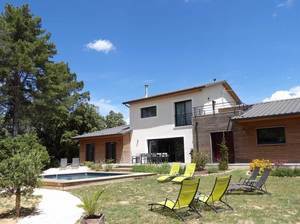 Du rêve Ô naturel lets you visit the Gard, Ardèche, Drôme and Vaucluse. A wide choice of activities and visits thus offers you during your stay. The house was designed following bioclimatic and environmental approach. It thus has a preferred orientation to maximize solar gain and minimize areas exposed to wind. The choice of materials (wood, aluminum, etc.) complements this approach. Each room has a double internal and external input to offer privacy and the rhythm you want during your stay. Some private bathrooms and an outdoor terrace complete the services available to you. The common spaceIn the center of the house, is a real window into the surrounding nature. You will discover a living room with wood stove for your indoor recreation (TV, reading, board games), dining room and kitchen to discover the dishes and local products around a dinner table. The outdoor terrace is itself a genuine connection with the pool. It takes the heart of a 2100m2 garden, Green environment near the forest: quiet and rest assured in the rhythm of singing cicadas !! !